Our greenhouses and garden sheds are stylish and trendy ways to spruce up your backyard with a multipurpose storage solution. 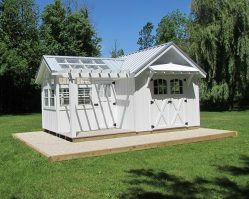 Built with the highest quality and care directly from the Amish, these are some of the most attractive premier garden sheds available in our lineup and in the shed industry. 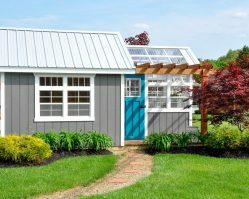 If you’re in the market for a storage shed, a greenhouse, or both, these sheds are a classy solution that you can’t go wrong with. Salem Structures offers 2 different types of Greenhouse Garden Sheds – a standard greenhouse potting shed and a farmhouse garden shed. 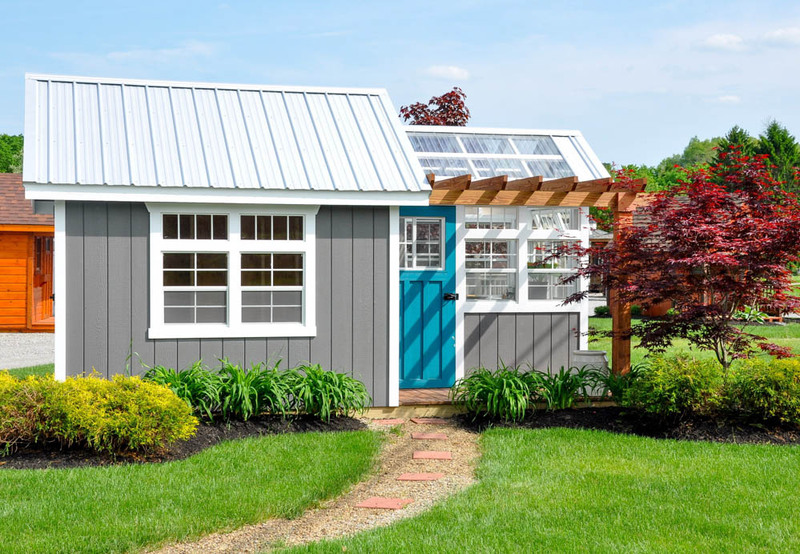 The farmhouse garden shed is the more expensive option, but it offers more features in standard form, like carriage double doors (for riding lawn mower access), farmhouse rain overhang, a workshop man door, and an interior divider man door. We offer our greenhouse garden sheds in a wide variety of sizes from 10′ x 16′ up to 10′ x 24′, and from 10′ x 16′ to 12′ x 20′ for our farmhouse potting sheds. If you’re looking for a smaller solution, our potting sheds are a great place to start. These are available in 6′ x 8′ and 6′ x 10′, both complete with a 4′ painted porch! Just like with all of our storage sheds, you’re able to customize your new greenhouse shed to truly make it your own. Some of these upgrade options include a flower box, stained pergola (above man-door), double window pergola, and an easy access ramp (available for all greenhouse sheds). You can also choose between various siding colors, shingles or a metal roof (for the farmhouse garden shed), as well as the trim colors. If you don’t see exactly what you’re looking for on our website or want to talk about our available customization options, we would love to discuss it with you. Just give us a call at (330) 332-9940 to get a free quote on the size and style of shed you’re looking for. See our Financing Options or Rent-To-Own Options. Wanting to get started on the spring planting but being held back by snow and cold weather is a struggle that we understand. However, it’s also a struggle that can be overcome. This 6′ x 10′ Greenhouse Potting Shed is the gardeners dream shed and the solution to the problems caused by lingering winter weather! Now you’re able to get an efficient head start on the spring planting – even if there’s still snow on the ground. 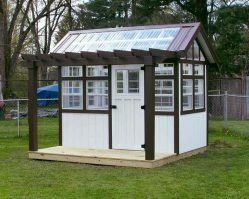 The greenhouse garden sheds offered here at Salem Structures are the best way to fulfill your gardening desires, and our premium potting shed is the perfect solution for those with limited space. As someone who loves gardening and the outdoors, have you ever wished you were able to get a head-start on your spring planting? Have you ever wished your gardening supplies were stored closer to your garden area and more convenient to access? Salem Structures Farmhouse Garden Sheds are mini-greenhouses that are exactly what you’ve been looking for! They’re a perfect solution for anyone wanting a jump start on their spring gardening or even wanting to grow flowers and herbs year-round. Our premium greenhouse sheds make it easier and more convenient than ever to get a head start on your gardening plans.